"... There are a number of people in the field that I have a lot of respect for. There's people like Peter Zinovieff, one of the unsung heroes in the synthesis world who's behind EMS and all their things. Most people don't realise how heavy his equipment is, they don't know how to use it. .."
Malcolm Cecil, interviewed in "Synapse" 1976. Most of the photos are black and white originals and have been scanned as a 256 colour greyscale. They are best viewed the same. Click on the small images to view the full high resolution ones. London geography lesson: Peter Zinovieff lived in Putney, David Cockerell lived in Cricklewood, the BBC Radiophonic Workshop was located in Delaware Road and Portabello Road was (and still is) a fashionable market. 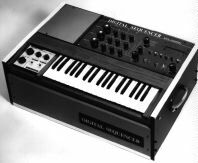 The original portable synthesizer introduced in 1969. A solid Aformosia cabinet housed the following modules interconnected by means of a matrix patchboard. 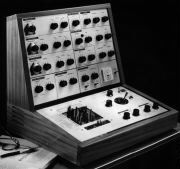 A "Live Performance Module" comprising two VCS3s side by side with a keyboard, mixer and signal processing in front all in a single wooden cabinet. There was only one prototype built, lost track of in 1983, but now known to be in the USA. Velocity sensitive "Dynamic" monophonic Keyboard for use with VCS3. Included an extra VCO and VCA. The same circuit modules as the VCS3 housed in a different case with a 29 note miniature keyboard, Prototype sold to Yes. The same technology as the VCS3, but built into a very large console patched with two 60 x 60 matrix boards, one for the signals and one for control voltages. 12 x Voltage Controlled Oscillator. 4 x Voltage Controlled Low Pass Filter. 4 x Voltage Controlled High Pass Filter. 3 x Trapezoid Envelope Generator. 2 x Voltage Controlled Reverberation. 8 x Stereo Output amplifiers. 2 x 5 octave Dynamic Keyboards. &LT;40 built. Sold mainly to Universities and radio stations, the most famous and overworked model belonged to the BBC Radiophonic Workshop and was the main synthesizer used throughout the 70s. Listen to their special showcase program "The Space Between", the original Hitchhikers' Guide to the Galaxy radio series or any John Pertwee vintage Dr. Who episodes. 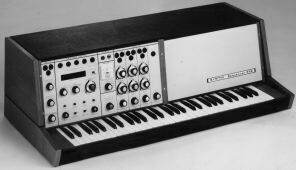 Peter Zinovieff and Tristam Cary walked into the Moog Trumansberg factory with this and just plugged it in, to much surprise and annoyance - their sequencer could only do 8 steps. 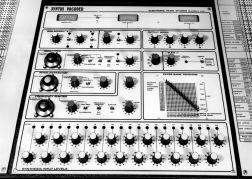 Separate version of the Synthi 100 sequencer. A design study for a follow up to the VCS3 case containing the same boards.This was believed lost until it recently appeared in Sound on Sound Oct 97/p190. 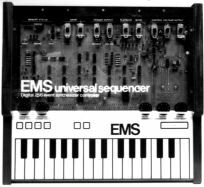 When this was being considered some engineers from the EMS factory arrived carrying a briefcase which turned out to be the prototype Synthi A. There was no contest. 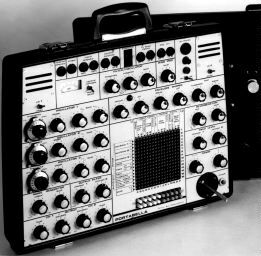 The prototype Synthi A. Note the name, the meter and the lid loudspeaker. Synthi A with a KS sequencer in the lid. 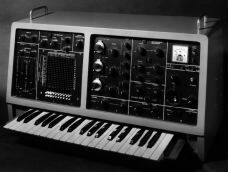 The first 30 Synthi AKs featured a black and silver Touch pad, Spin-and-touch random note selector and an unplayable resistive touch sensitive keyboard. This was replaced by the familiar blue capacitive touch sensitive keyboard with integrated sequencer. A mechanical keyboard version of the KS sequencer. The sequencer from the Synthi AKS available separately. Sequence length range: 700ms to 100s. A guitar treatment unit built as a console on a stand with two pedal controllers which could be routed as control voltages to any of the slider functions. Top Boost Slider to provide up to 30db boost at high frequencies. The output from this section goes to the Octave Shift, Sustained Fuzz and Ring Mod sections. Octave Shift Slider mixes in a Sub Octave signal. Buzz Switch adds high frequency overtones to the sub octave signal. Ring Mod Slider mixes in a signal an octave up when single notes are played or "ring modulated" effects on chords. Decay Rate Rotary control for the decay time of Ring Mod and Octave Shift signals. Sustain Fuzz Slider mixes variable upper harmonics. Attack Rate Rotary control varies the rise time of the sustained fuzz signal. Pedal Switches Each switch routes either the left or right pedal to voltage control the Slider above it. Each switch also has an inverted setting so that single pedal movements can produce complimentary effects. Solo/Strum Switch to alter the Hi-Fli's sensitivity to playing style. Bypass Mix Central Slider to blend the effects and original signal. Modulation Selector Rotary Switch selects: Slow Modulation range, Fast Modulation range, Rising Mod envelope, Falling Mod envelope, Rising Ramp and Falling Ramp. Treatment Selector Rotary switch selects: VIBRATO, PHASING 1, PHASING 2, WAA-WAA (single resonant peak), WAW-WAW (six resonant peaks) and MEOW (two sets of three peaks in opposite directions). Modulation Speed Slider to fine control the modulation rate. Modulation Ramp Time Slider to set ramp time between 0 and 5 seconds. Modulation Depth Slider controlling depth of modulation applied to Phase Filter. Frequency Shift Slider to bias the symmetry of modulation. Input Signal: 10mV (min) to 3V (max), 100kohm impedance. Output Signal: -20dbm (min) to 0dbm (max). Prestopatch added, matrix layout and some circuitry changed, otherwise same as VCS3 Mk I.
Patchboard for interconnecting two VCS3s or Synthi As by plugging into the Prestopatch sockets. Larger version of above with keyboard sockets. A MkIII "Professional" version with improved Oscillators, Filter and Envelope. 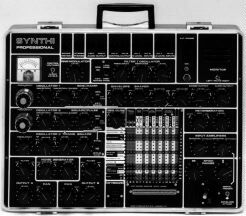 Only 3 prototypes made, 2 in this form with bronze finish, the other in standard Synthi A case and styling. Prototype with graphic Formant entry (drawn with a ballpoint pen!). Innovative Video Synthesiser using analogue and digital techniques. Digital Matrix Patch Panel: 53 inputs by 57 outputs. Analogue Matrix Patch Panel: 16 by 20. Manual, VCO and Audio controls. Digital counters, delays and video modifiers. The prototype was used to provide a projected lightshow for an early Tangerine Dream concert at the London Rainbow. A low cost "Educational" synthesizer in briefcase format. 3 x VCO 1Hz - 10kHz. VCF LP - BP - HP / Oscillator. Noise, Inverter, Mixer, Modulator, Internal monitor. A 3 octave mechanical keyboard for Synthi E.
Four channel quad surround sound mixer with joystick and quadrature VCO control. A two channel version was also made fitted into a custom Electrosonic EMS Mixing Console. Separate version of the one in the Vocoder 5000. 22 Band Filter + Follower + Modulator Filter with 22 x 22 matrix patchboard. Mic/Line Input, 2 Oscillators & Noise sources. Voiced/Unvoiced detector and slew/freeze control. 3 PPM meters, Spectrum display driver and comprehensive interfacing. Upgraded KS with Control Voltage and Gate interface. 16 Band Filter + Follower + Modulator Filter. Mic/Line Input, Oscillator & Noise sources. Replacement circuit boards featuring improved VCOs with temperature compensation and synchronisation, improved VCAs, RM and Reverb. Four Octave keyboard with Aftertouch. Noise and External input with envelope follower. Designers: Peter Zinovieff and Graham Hinton. Microprocessor based polyphonic sequencer with up to 10 minutes recording capacity. Real time editing and effects. All material on these pages Copyright ©1995 - 1998 Graham Hinton & Robin Wood. Most photos are from the EMS Archive and have never been used before. 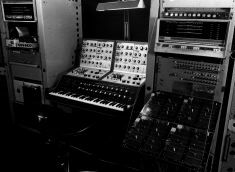 Synthi is a trademark of Electronic Music Studios. All manufacturers' trademarks are acknowledged.